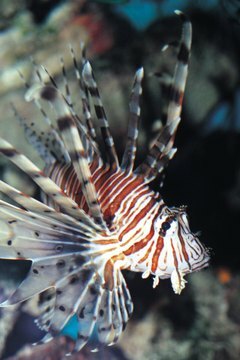 Lionfish are prized fish in the aquarium trade. Their long fan of spines and bright colors make them popular for display. While these fish are tropical animals found in the Indo-Pacific region, they have become intrusive species in other areas. Lionfish are part of a larger group of venomous fish called scorpion fish, which are mostly bottom-dwelling animals. The family Scorpaenidae is also generally known as the scorpion fish family. It has almost 400 species and 45 different genera throughout the world's oceans. Most of the scorpion fish are venomous and rely on camouflage against the sandy and rocky ocean floor. They are largely sedentary fish that lie in wait for their prey. The venom from these fish come from spikes and spines on their skin and contain a powerful neurotoxin that can be extremely painful to humans. Within the family Scorpaenidae, there are three sub-families. One of these is also named Scorpaenidae and include the specifically-named scorpion fish. These fish species exhibit the typical behavior of its general family, including a sedentary lifestyle, a lie-in-wait predator technique and the use of camouflage to blend into their surroundings. Scorpion fish are widespread in the earth's oceans and can be found in temperate and tropical waters, often in muddy and sandy areas, or places with coral. Even though scorpion fish have bright colors to warn other animals that they are poisonous, these colors can often be hidden or obstructed by its camouflage. Lionfish are somewhat atypical of the general family Scorpaenidae. Rather than being widespread in both temperate and tropical areas, the lionfish come from the tropical Indo-Pacific region. They are also free swimmers rather than predators that wait on the ocean floor. They grow to an average of 1 foot in length and are easily identifiable by their bright red zebra-like stripes as well as their spines that fan out in display. Even though they come from the same family of fishes, lionfish are quite different than typical scorpion fish. Lionfish do not lie in wait for prey on the bottom of the ocean, and they freely swim amid coral reefs. Their appearance is quite different, as they display barbs and spines versus the smaller bumps on a scorpionfish. Both types of fish are venomous, though the behavior and activity of a lionfish make it easier to identify and see in the open. In aquariums, they can co-exist as long as they are of similar sizes and one is not big enough to swallow the other.